Confirmation bias – the act of perceiving information in a way in which confirms your pre-existing beliefs – is hard to avoid when Brexit continues to veer towards a long extension in A50. Developments in Westminster last night saw Parliament rule out a no-deal Brexit on April 12, should the House of Lords confirm the Letwin-Cooper bill today. Meanwhile, Chancellor of the Exchequer, Philip Hammond stated in an interview with ITV that another extension is likely to be longer than those seen previously, meaning the UK would have to participate in EU Parliamentary elections in May. However, Hammond suggested that such an extension should have the potential for a guillotine clause that would introduce another Brexit deadline should a deal be passed within the extension period. Meanwhile, House of Commons speaker John Bercow hit the headlines again yesterday after Parliament reached a tie on the Benn amendment for a third round of indicative votes. Bercow recited precedent and sided with rejecting the vote. This is the first time Parliament has struck a tie since the 1993 vote on the Maastricht Treaty – very fitting. However, a miscounting in votes back in 1993 made Betty Boothroyd’s vote unnecessary the next day. 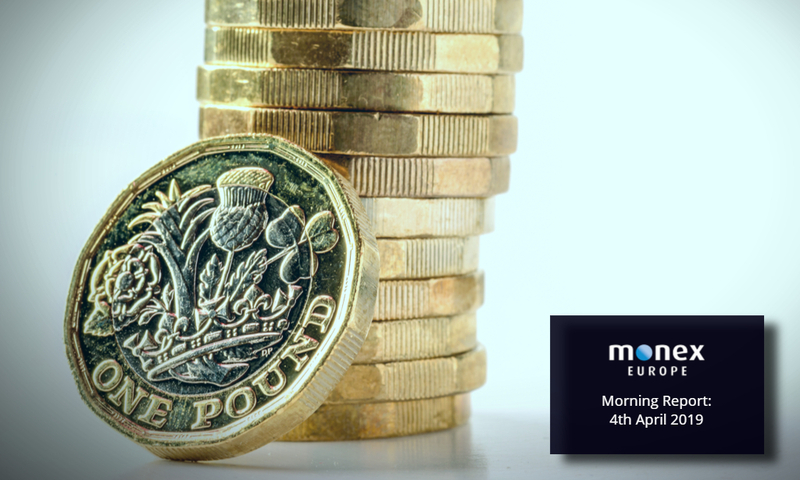 Sterling briefly jumped on the news, but with the economy showing signs of faltering due to Brexit uncertainty, little relief came for the pound. March’s Services PMI indicated that Brexit has taken another victim hostage as UK service sector shrank for the first time since the month after the referendum result as a consequence of delayed investment and lacklustre demand. The release doesn’t bode well for a positive Q1 GDP reading. The euro found a leg of support yesterday after positive readings in German, French, Spanish and Italian Service PMIs. A glimmer of hope from the service sector helped the single currency to gain a quarter of a percentage point against the US dollar yesterday, but concerns still remain over lacklustre Eurozone growth as the manufacturing sector continues to face headwinds. With monthly PMIs proving noisy, yesterday’s data have done little to change Q1’s likely slowdown in GDP growth within Eurozone. The positive surprises didn’t end there for the Eurozone with February’s Retail Sales surprising marginally to the upside at 0.4% MoM. This morning’s release of German factory orders takes some of the shine off of yesterday’s hope as a 4.2% contraction occurred in February. Yields on US Treasuries began to rise yesterday as the dollar softened across the board. The DXY dollar index fell 0.22%, the first slump in the greenback in the last 6 trading sessions. The fall in the US dollar came amidst a plateauing risk-off environment, which saw JPY and CHF also underperform most of the G10 currencies. US economic data did little to stem the greenback’s demise with ADP stating the US economy only added 129k jobs in March, 46k less than expected, and the ISM non-manufacturing index falling to the lowest since mid-2017. The dollar trades flat this morning with little data scheduled on the calendar. Meanwhile, President Trump is expected to meet with Liu He, China’s Vice Premier, in the oval office tonight at 21:30 BST where political experts anticipate a date for the US-China trade summit to be announced. Builds in crude inventories yesterday saw WTI prices slip from the highs but the loonie continued to fare well, trading marginally lower at the close of play as the US dollar softened in general. Improved global risk appetite was seen in a number of asset classes after a series of positive Chinese and European Purchasing Managers Indices. Today at 14:00 the Ivey Purchasing Managers Index will be released.